Illustrated by R. W. Alley.32 p., Dial, 2006. Gender prejudice can limit children's experience of their choices. When Nate's kindergarten class attends a performance by a ballet school, he falls in ove with ballet. Nate's brother, Ben, repeatedly tells him that he can't study ballet, because he's a boy, and that ballerinas have to wear a dress and pink shoes. Nate's parents calmly dispel these myths, and Nate asserts his right to dance. But Nate wants passionately to learn ballet, and until he can begin classes, he dances at home, in his yard, and on his driveway, and reads books about ballet. When he does begin classes, he's a bit alarmed to find that he's the only boy there. but he loves his teacher and he loves the class. In response to Nate's continuing discouragement about whether he can really be a ballerina, his mother takes him to a professional ballet, where he is not only stunned by the beauty of the performance, but also sees that half of the dancers are men. Afterward, his mother takes him backstage, where he meets one of the male dancer, who explains that the word ballerina is reserved for women who are the top dancers in a company - and that the equivalent term for men is ballerino. Now he knows he can truly be a ballet dancer. Playfully illustrated, this story shows children that it's possible to follow your heart even in spite of gender stereotypes. When your favorite uncle gets married, you might worry that you'll lose the special relationship you have with him. Such is the case for little guinea pig Chloe, when her favorite uncle, Bobby, announces his engagement. Bobby welcomes Chloe's concerns and reassures her that she'll always be special to him. When Chloe goes to the ballet and sailing with Bobby and his fiancé, Jamie, she discovers that she can have great fun with both of them, and finds herself wishing that they were both her uncles. Bobby explains that when he and Jamie are married, that's exactly how it will be. Chloe is Bobby and Jamie's flower girl, and she chooses the wedding cake. She's able to participate joyfully in the wedding. Illustrated with colorful, tenderly expressive watercolors, this story is full of acceptance and reassurance. Illustrated by Stéphane Jorisch.32 p., Dial, 2006. The sudden death of a caring teacher is a painful loss. As this caring, warm-hearted story begins, Stevie has just moved and started attending a new school. He feels lonely and worried until his teacher, Miss Perry, empathizes with him and invites him to join her for lunch, using the charming phrase that this is her "fondest wish." It turns out that Miss Perry has fondest wishes about many things, including classroom activities and appropriate behavior. Then, one day, Miss Perry isn't at school. The principal teaches the children in the morning, and after lunch, all of their parents are there. Gently, the prinicipal explains that Miss Perry died in a head-on collision on her way to school that day. Children cling to their parents, cry, and ask questions, which the principal answers kindly. The principal and school counselor spend the next day with the class. Normalizing the children's tears, the counselor asks them to tell her about Miss Perry. With the principal's encouragement, they recall together the good times they'd had with her - and her fondest wishes. The counselor invites the children to consider what Miss Perry's fondest wish would be for that day. Although they're sad, the children are able to suggest tributes to Miss Perry: not being too sad, remembering the fun they'd had with her, getting along well with one another, learning a lot in school, and finally, being happy the way Miss Perry had been. The gentle ink, watercolor, and gouache illustrations clearly convey the characters' emotions. Children who have had a loss like Stevie's will feel supported and will better understand the process of grieving. Illustrated by Maxie Chambliss.32 p., Boyds Mills, 2007. When there's a new baby in the family, sometimes the older child feels as if the baby gets all the attention. In this story, adults get excited when baby James does things like smile, roll over, and even burp. Big brother Brendan responds by showing how well he can do each of these things. When James finally learns to walk everyone wants him to walk to them, but James walks to Brendan for a hug. Brendan is happy, and Mom describes this as evidence of James's love for him. Charmingly illustrated in watercolors with a primarily pastel color palette, this story supports the unique importance of the older sibling. Illustrated by Nancy Lou Reynolds.29 p., Annick Press, 1984. Feelings about divorce can be complicated. In this story, a girl lives with her brother and Mommy in the city, and spends weekends with Daddy in the country. Although she knows it won't happen, she can't help wishing that her parents would get back together again. She likes her life with each parent, and values what's special about her relationship with each one, although there's a sense of disruption in going back and forth, expressed in her wondering whether Santa Claus will know where to find her on Christmas. She struggles to understand why Mommy and Daddy can't make each other happy. But she finds comfort in knowing that she loves both parents and they both love her, "just not together." This sensitive portrayal of a child's complex feelings about divorce, and her work toward resolving what feel like inconsistencies, will resonate with children in similar situations. 32 p., Front Street, 2008. Being friends is about more than being alike. Pearl Barley and Charlie Parsley are great friends, and they’re very different from each other. For example, Pearl likes to run amok, whereas Charlie likes to sit and think. But they’re friends because they care for each other. For example, when Pearl forgets her mittens, Charlie warms her hands in his. They use their strengths to support each other; for example, when Charlie is scared, Pearl helps him feel brave. The acrylic and mixed media illustrations are edgy and warm at the same time. This sweet story will deepen children’s understanding of the meaning of friendship. Mama and Papa are getting ready to go out for the evening, and Jamie, who is about four years old and who is to stay with a babysitter, doesn't want them to go. He asks for, and receives, assurances of Mama's love, even if she is angry at him, or he is angry at her, or runs away, or is unaffectionate. He concludes that he doesn't want Mama to go out, but he still loves her - just in time for Mama to tuck him into bed before leaving. This story sensitively addresses feelings children might have about staying with a babysitter, and reassures them that their parents can contain and accept their feelings. Translated by Eida de la Vega. Illustrated by Robert L. Sweetland.32 p., Raven Tree, 2004. Friendship can include finding similarities when differences are present, and appreciating each other’s uniqueness. In this bilingual (English and Spanish) book, Dominic describes what he values about his friend Victor – his imagination, his jokes, his encouragement, and his scary stories. He tells how they enjoy swimming, riding amusement park rides, and having sleepovers together. What Dominic likes best about Victor is that Victor accepts him just as he is. It isn’t until the last page that we see that Victor uses a wheelchair. The colorful illustrations effectively convey the fun the boys have together. Whether or not they use a wheelchair, children will see that disability is only one attribute among many, and less important than the qualities that make a good friend. Illustrated by Janet Wilson.32 p., Viking, 1991. Claire wishes she were as brave as her sister, Jess. Jess is brave when they get shots at the doctor's office, climb trees, meet big dogs, and watch scary TV shows. She's not afraid of the dark or thunderstorms. Their father attributes Claire's fearfulness to an excessive imagination. But when bullies take Jess's teddy bear, Claire uses this imagination bravely to get them to give the bear back. This story shows children that they can be brave even though they think of themselves as fearful - and in fact, the source of their fears can also be a source of courage. Illustrated by Kay Life.32 p., Boyds Mills, 2005. When a parent has been away, even the joy of homecoming can be tinged with worry and concern. Bobby’s father is coming home from the Navy, and Bobby is taking a special heart-shaped red balloon when he and Mom go to meet his ship. Mom has told Daddy that he will have the balloon when they reunite, and to Bobby, this means that Daddy will know it’s him by the balloon. He worries that Daddy won’t recognize him, so when the balloon comes loose and flies away, he bursts into tears. But the balloon floats over to the sailors, and Bobby sees Daddy and calls to him. Daddy tells him that he know the balloon was his, and then he found Bobby in the crowd. The red balloons stands out in the realistic, pastel-colored watercolor illustrations. When a parent is away for a long time, this story offers children reassurance that they can count on the relationship. Sometimes even the best of friends feel jealous and have conflicts. Preschoolers Mary and Clare are “best best friends” who like to do everything together. But on Mary’s birthday, she gets special treatment at preschool that gets in the way of their routines. Clare feels resentful and jealous, and talks to Mary in a mildly hurtful way. They verbalize anger at each other and say that they aren’t friends. After each plays with other children, Clare draws a picture for Mary and wishes her a happy birthday. Mary invites her to play, and they’re friends again. Illustrated with boldly printed, eye-catching illustrations, this story shows young children how to recover from inevitable conflicts and maintain friendships. Illustrated by Jon Berkeley. 28 p., Carolrhoda, 2005. Here’s a story about losing a tooth from a tooth fairy’s point of view. Sally is seven years old, and is becoming a tooth fairy just like her mother, grandmother, and great-grandmother. To be a real tooth fairy, she has to get her first tooth. Having been advised to be patient, to look on the bright side of things, to get that tooth, and to be sure not to wake a child, she flies off into the night. Under the child’s pillow, instead of a tooth, she finds a note telling her that she’ll have to find the tooth using clues the child has left for her. As she finds each clue, she uses her foremothers’ advice, and she finally finds the tooth. And she leaves the child with her own treasure hunt. Accompanied by lovely, night-hued watercolor illustrations, this humorous, encouraging story shows children a new side of losing a tooth. llustrated by Nicole Wong.32 p., Magination, 2007. When someone close has a stroke, this can require a significant adjustment for children. Ryan loves to fish with Grandpa every Saturday, until one Saturday Grandpa can’t come because he is hospitalized with a stroke. His father explains in a gentle, age-appropriate way what a stroke is, and his mother validates the need to cry when you’re sad, regardless of your age. As Ryan visits Grandpa at the hospital, and then later at a rehabilitation facility, he feels worried and distressed when Grandpa doesn’t look quite like himself and says uncharacteristic things. It’s hard for him to see his grandfather like this. Ryan’s mother reassures him that although Grandpa may never be the same, he is still Ryan’s grandpa and still loves him. Eventually, Grandpa comes to live with Ryan. He seems unhappy at first, but Ryan thinks of the perfect way to cheer Grandpa – and himself – up: with Mom’s help, he takes Grandpa fishing. Both Ryan and Grandpa find a new way to do what they’ve always loved doing together. An afterword for parents gives helpful suggestions about ways to talk with kids about a stroke, respond to kids’ feelings about it, and help kids cope. The softly colored illustrations suggest a world of kindness and caring. With Ryan, children will feel they’re not alone, and will find ways to cope with a loved one’s stroke. 32 p., Little, Brown, 1997. Toot and Puddle (two pigs) are best friends. Puddle likes to stay home, and Toot likes to travel. When Toot takes his longest trip ever, he has adventures around the world, while Puddle has adventures at home. Toot's story is told in his postcards to Puddle. They are happily reunited at the end of the story. There is a nice sense of equality of the two friends' experiences. Children will understand that friendship gives both individuals room to be themselves (even if it means being apart) as well as joyful togetherness. Worries about performing are common among children. They will identify with Harriet, a little dog who loves her ballet class, but is terrified by the thought of a recital. As her class is dancing onto the stage, Harriet is crying, saying she can’t do it, and rejecting her teacher’s suggestion to take a deep breath. But she has to go on stage anyway, and once there, she takes two deep breaths, begins her steps, and finds herself dancing. When she is absorbed in her dance, she seems to forget all about her fear. The recital ends with compliments from her parents. The author’s vibrant, charming, illustrations clearly convey Harriet’s changing emotions. Harriet shows children that even when they’re scared, they can perform well. Illustrated by Pierr Morgan.32 p., Viking, 2011. When you hear a noise at night, it can be scary! The little bunny in this story hears all kinds of noises, and can't help imagining that they're being made by all kinds of terrible monsters. And "if that is true, what'll we do?" The bunny, BunBun (who can be interpreted as either male or female), gets comfort from a teddy bear: when the teddy bear sits quietly, in spite of the scary noises,BunBun can too. But the noises continue, and BunBun's imagination along with them. BunBun's last guess about the monster's identity - a "Two-Headed Whiney Snoop" - turns out to be close to accurate: it's BunBun's little brother, FonFon. FonFon's pull toy had been making the scary noises - and FonFon had come to see what was the matter because he'd heard thumps and bumps, which were the sounds of BunBun jumping into bed. FonFon is scared, and gets into bed with BunBun. The scary noises have an irresistible rhythm, the monster names and illustrations are wonderfully creative (just as children's imaginations are), and repetition is used with great charm and effectiveness. And there's a delicious linguistic surprise at the end, too. The richly colored illustrations on a night-black background show BunBun's emotions and perspective so clearly that we're right there in BunBun's experience. Bringing humor and delight to a frightening situation, without in the least discounting the child's fear, this story will help children understand how fear transforms ordinary situations into dangerous-seeming ones. If your child is already very anxious at bedtime, it might be best to read this story earlier in the day, at least at first. 32 p., Boyds Mills, 2009. With imagination and persistence, all kinds of things are possible. Grant the aardvark and Antoine the armadillo have a do-it-yourself time machine, otherwise known as a cardboard box. With Samantha the anteater, they turn the box into a time machine and try to launch it, but it won't blast off. Samantha's persistence is important: she responds to this with, "Back to work, boys." The friends decide that maybe it isn't a "rockety" kind of time machine, but a rolling one. And they make it roll. When it falls over, Grant and Antoine are discouraged, but Sam encourages them to keep going. While they're distracted, she fixes the time machine, making it into a bookmobile - which, of course, allows the friends to go backward and forward in time through stories. With amusing, colorful illustrations, and positive messages about reading, this story supports kids in both imagination and perseverance. Illustrated by Laurie Caple.32 p., Boyds Mills, 2004. Having a parent in prison is an especially painful occasion for separation. In this tender, compassionate story, a little girl called Sugar has always loved her Mama's bedtime stories, especially the story of her own birth, on Mama's birthday. When Mama goes "away" (there's no doubt from the illustrations that Mama is in prison), Sugar stays with Grammy, and they visit Mama on Sundays. Each Sunday they reunite lovingly, but, as Sugar points out, "it's not the same as home." When their birthday is coming, Sugar makes a birthday card for Mama. Grammy warns her not to expect Mama ato give her a birthday present.. But Mama gives Sugar the best possible gift - a notebook in which she has written and ilustrated seven of her stories. She tells Sugar to read one story each night of the week at 8:00, and she will whisper the story to Sugar at the same time. Illustrated with paintings that beautifully convey both the little girl's emotions and the love between mother and daughter, this story shows children how stories can help maintain a bond in difficult times. 13 p., Centering Corporation, 1998. A girl recalls the fun she and her brother had with their Nanny, who used to hide candy and animal crackers for them at her house. Nanny declines cognitively and physically, and is taken to live in a nursing home. One day, when the girl has used her whole allowance to buy Nanny some animal crackers, she comes home from school to find out that Nanny has died. The girl feels angry and sad. At Nanny's funeral, her dad reads a poem that she wrote about Nanny at school. The girl and her brother help their dad give everyone present animal crackers, which facilitates their sharing happy memories of Nanny. The girl concludes that her heart is full of memories of Nanny. No illustrations. This story shows children a way to say goodbye to someone who has died and to keep their memories of the person with them. Illustrated by Elizabeth Gómez. 32 p., Children's, 2005. Kids' feelings about starting school can fluctuate between excitement and fear. In this bilingual book, Luna is excited to start school for the first time. But on the first day, she wakes up frightened - what if there are monsters at school? She's reassured by her mommy's hugs and kisses and her own knowledge that she's "five years old and as big as the full moon," although her fears come back several times as she gets ready for school. When her mommy drops her off, she's frightened, and hides under a table. But her classmates encourage her to come out and play, and she begins to make friends. She draws, plays, and hears a story. When her parents pick her up, she tells them that there are no monsters at school after all. The colorful acrylic illustrations include crayon renderings of the monsters that Luna imagines. With Luna, children will find empathy for their shifting feelings and reassurance that they will be happy at school. Illustrated by Gordon Silveria.32 p., Scholastic, 1994. A triangle does lots of important and interesting things, but one day it gets bored, and decides that it wants to be a different shape. It visits a shapeshifter, who turns it into many other shapes. As the triangle gets more and more sides, it grows more distant from its friends, and begins to feel out of balance. When it finally decides to become a triangle again, it is back in balance, happy, and reunited with its friends. Children will get the message that although it might seem interesting to be someone else, it feels best to be who you are. An afterword for adults explains the geometric concepts and suggests ways to teach them to children. Illustrated by Melissa Bay Mathis.32 p., Philomel, 1994. Jon asks family members and friends what they did when his Granddad Bill died. Each shares reactions to Bill's death and memories of Bill. Jon is angry when his Grandad dies, and feels guilty about this until he talks it over with his Daddy. It becomes clear that each person, including Jon, can keep Bill with them in important ways after his death. Black-and-white drawings show Jon and his relatives and friends in the present and the photos of Bill that that they look at together; vibrantly colored illustrations on two-page spreads show memories of Bill. This story helps children accept diverse ways to grieve, and to understand that we can keep people who have died with us in our memories of them. 32 p., Frances Foster Books/Farrar Straus Giroux, 1997. As a child in Germany, the main character, a European Jew, has a doll named Elisabeth whom she loves very much. She has to leave Elisabeth behind when her family flees from the Nazis, eventually to the United States. There she grows up, and searches for a doll for her own daughter, remembering Elisabeth. Amazingly, she finds Elisabeth in an antique store. At the end of the story, Elisabeth has been handed down to her granddaughter. A brief note explains that this is a true story in the life of the author's mother. 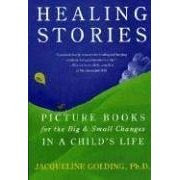 This book will help children see hope for healing the losses of war. Illustrated by Kathy Parkinson. 24 p., Whitman, 2003. Jealousy can be a difficult feeling for children. In this accepting, empathic, story, a little bear lets children know they're not alone with jealousy by acknowledging that everyone, even pets, feels this way sometimes. She can cope with jealousy by talking about it with someone, and by expressing her own needs, especially for attention (although she might not be able to have it right away, and so might have to find something else to do while she's waiting). She can also learn to be happy for others rather than jealous of them, and can appreciate what she has rather than focusing exclusively on what others have. When this is possible, she doesn't feel so jealous any more. Knowing this helps the little bear to realize that jealousy, while uncomfortable, is temporary. An accessible, compassionate note to parents and teachers helps adults to understand children's jealousy and to offer support in resolving it. Illustrations are both sweet and expressive. Even very young children can use the little bear as a wonderful model of self-acceptance, emotional awareness, and coping. Illustrated by Ronald Himler. 32 p., Eerdmans, 2004. When a beloved pet dies, it's hard to make room in your heart for a new pet - but sometimes it's not only possible, but it makes room for a new source of joy. Victor has an elderly cat named Charlie whom he loves very much. Near the end of his life, the vet can't help him, and he dies. Victor and his mom bury Charlie in the backyard and plant a rosebush in his honor. Victor cries all the time for two days. He doesn't want to eat his favorite food. His mom, his, teacher, and his classmates are sympathetic and caring, but he still misses Charlie terribly. When his mom suggests a new cat, he just wants Charlie back. But then the vet calls. She has a kitten who needs a home. Victor agrees to meet her, and decides that she does want to come home with him. The new kitten, Shelley, doesn't do the endearing things Charlie did. But she does some pretty adorable things that Charlie didn't. Victor begins to understand that although Shelley can't be Charlie, she can be wonderful in her own way. Each cat can be the best cat in the world. The watercolor illustrations are gentle and evocative. Empathic and hopeful, this story shows children a way to go on after a painful loss. Illustrated by Jan Ormerod. 32 p., Simon & Schuster, 2006. Mamas everywhere love their babies all day long. In this sweet, rhyming story, Mamas begin their day by lifting their babies from their cribs, and care lovingly for the babies all day long. They play at the beach and in the garden, walk on city streets, and visit markets. As the end of the day nears, mamas bathe their babies, read them stories, rock them, and sing to them. The story ends with the reader's love for the child hearing the story. The pencil and wash illustrations give curious little ones much to look at and talk about, with a gentle level of stimulation that's appropriate for the youngest book lovers. Children will feel a sense of peace and security reading this book. Illustrated by Pierre Pratt. 32 p., Candlewick, 2008. Getting big can can happen a little at a time. When Little Monkey is awake and ready to play when his mama and other family members still want to sleep, he decides that he's a "big little monkey" (a wonderful description of being both big and little), big enough to find other friends to play with. He visits several animals in the jungle, none of whom is very welcoming. Each time, Little Monkey decides that his new companion isn't quite right for him. As he continues to swing through the jungle, he returns home, to a family that's now awake. He explains that although he's big enough to play with others, he can also stay home and play with his family - because even though he's big, sometimes he's little too. With vividly-colored acrylic illustrations, this story shows empathy and acceptance of children's needs to be both big and little as they grow up. The A.D.D. Book for Kids by Shelley Rotner and Sheila Kelly, Ed.D. Illustrated by Shelley Rotner. 32 p., Millbrook, 2000. When kids struggle with attention, organization, and self-control, help and empathy are important. This non-fiction book addresses symptoms of Attention Deficit/Hyperactivity Disorder - Predominantly Inattentive Type, also known as Attention Deficit Disorder or ADD. It tells what the symptoms feel like from a child's perspective, and mentions several ways that teaches and parents can help (for example, giving one assignment at a time, making a written chore chart), as well as mentioning medication. The authors reassure children that they aren't to blame for an attention disorder, and that having one doesn't mean that the child isn't smart. The book ends on an upbeat note, with hope for success. Illustrated with color photographs of children in their day-to-day lives, this child-friendly book helps kids understand attention disorder and supports their self-esteem and hopefulness. Illustrated by Greg Swearingen. 32 p., Whitman, 2006. When children worry repeatedly (for example, about germs, illness, doing or thinking bad things, or things not being "right"), and when they develop behaviors intended to manage those worries (for example, repeatedly counting things or checking things, repeatedly asking the same question, washing their hands very often, doing things in a certain order, or putting things in order, they may have Obsessive Compulsive Disorder (OCD). Kevin experiences both obsessions and compulsions in this story - he worries about whether he did his homework and put it in his backpack, he worries that he might have cancer, he worries that there's a light under his bed, and he worries that his mother might be an alien. He asks both his mother and his teacher the same questions over and over again, and checks under his bed repeatedly. He has to have his chair in a certain place before he goes to sleep. Having all these worries makes him worry that he's crazy. When he tells his mother about some of them, she assures him that his parents will help. They take him to see Dr. Fraser, who educates him about OCD, explaining that his obsessive thoughts are like wrong numbers on the phone and that she will teach him to hang up on those messages. He takes medicine and they pick one compulsive behavior a week to stop. Kevin's mother supports him by encouraging him to tell "Mr. Worry" that Kevin is in charge and won't listen to him. Although the worries sometimes come back when he's tired or overly busy, he makes progress. The frequency of his therapy visits is reduced. This story depicts cognitive behavior therapy, one of several approaches that can be used to help children with OCD. Children who are receiving this form of therapy for OCD will find this book empathic, affirming, and hopeful. When you admire others, sometimes you lose track of your own strengths. Such is the case for Fred, a little bunny who admires other animals' tails. A raccoon's tail has beautiful stripes, a mouse's tail is wonderfully long, a peacock's tail is fantastically colorful, and a porcupine's tail is impressively spiky. When Fred tries to emulate these tails, they don't work for him - for example, when he puts toothpicks on his tail to make it spiky, it hurts to sit down. So Fred is surprised when Lulu, a rhinoceros, complements his tail, specifically because it's "not too stripy...not too long...not to colorful...not too spiky." Fred and Lulu spend a fun day together, Fred happily unencumbered by his "enhanced" tails. He is even able to offer Lulu a compliment. The heavily-outlined illustrations are engaging and expressive. This story delivers a powerful message about both the value of being yourself and the importance of how you feel compared to how you look. Illustrated by Blanche Sims. 40 p., Whitman, 1989. The first author, a fourth-grader, tells other kids about his own experiences with asthma, and how scared and confused he felt at first. He shares what he learned about what asthma is and self-care for asthma. He also discusses his feelings of aloneness when he was first diagnosed, writes about people with asthma who have achieved significant accomplishments, and invites readers to write to him if they want to talk with another kid who has asthma. Cartoon-like illustrations depict asthma as a furry little monster. This book offers kids helpful information, support, and empowerment through taking care of themselves. Illustrated by Meryl Treatner. 32 p., Whitman, 2006. Tourette's Syndrome can be difficult to understand and cope with, but knowledge, coping strategies, an understanding family, and caring friends can help. In this story, Nathan develops one tic and then another. His friends think his tics are weird, and other kids point and laugh. Because he doesn't have tics while swimming, even his mother thinks they're voluntary. Finally, Nathan's parents take him to a "special doctor," who diagnoses Tourette's Syndrome and explains it as a neurologic disorder. After this, Nathan's parents work with him to identify times when he's at higher risk for tics and ways to cope with them. Telling his best friend and his class about his diagnosis increases the support that's available to him. Nathan even finds that he can tell strangers about it. He learns to have a sense of humor about his tics. And as he kicks a goal while playing soccer, he realizes that tics aren't the only moves that he can make - he isn't defined by the disorder. A note to adults explains Tourette's Syndrome. This story will help children who have Tourette's feel optimistic about coping, and will help other children to be more understanding and accepting of the symptoms in those who do. 32 p., Little, Brown, 2006. Daily separations are more tolerable when we know that we're in the hearts of those we love. In this warm, caring story, a mother tells her child (who may be intended as a boy but can be seen as boy or girl) that when she's at work and the child is at school, she keeps the child securely in her heart, no matter what she's doing and no matter what the child's doing. When the mother misses the child, she just looks inside her heart and sees the child there, and is happy again. As the story ends, the mother is telling the child that s/he carries in his/her heart all the people (and pets) that s/he loves. The mixed-media illustrations are bursting with energy and affection. Addressing separation with optimism and empathy, this story gives children what they need for the times they can't be with those they love. Illustrated by Peter Greste. 32 p., Scholastic, 2006. If we keep our minds open, friendships can happen when we least expect them. In this remarkable true story, a baby hippopotamus named Owen and a 130-year-old tortoise named Mzee become the best of friends. Owen lived near a village in Kenya with his mother and their pod (group) of hippos, when a tsunami left him alone in the sea. With great difficulty, villagers and visitors rescued him, and he was taken to an animal sanctuary about 50 miles away. There he met Mzee, who was generally unfriendly to everyone except for the chief animal caretaker there. As soon as Owen arrived, he went right to Mzee and hid behind him, just as he might have hidden behind his mother. Mzee initially rejected this attention, but Owen persisted, and by the next morning, they were snuggling together. Soon, Owen began to eat, but only when he was with Mzee. The two animals became inseparable, playing affectionately together. Two years later, when this book was published, they remained the best of friends. Illustrated with color photographs, this story shows children that even in dire circumstances, completely unexpected friendships can form and can make all the difference in the world. It Hurts When I Poop! by Howard J. Bennett, M.D. Illustrated by M. S. Weber. 32 p., Magination, 2007. When you're afraid that it will hurt to poop, it becomes scary to sit on the potty. Ryan, a little boy who loves to play with dinosaur toys, has this experience, because he knows that big poops hurt coming out. As a result, he tries to hold poops in, and he gets frequent tummy aches. Ryan's pediatrician, Dr. Gold, tells him a story about a coyote who lets his house fill up with trash, until he decides to take control of the situation and be the boss of the trash. The coyote cleans up his house and feels happy and proud. Dr. Gold offers Ryan a program to help him become the boss of his body, just as the coyote became the boss of his house. She explains how poop is made and that "Letting the poop out stops the tummy aches and makes people feel better." She reassures Ryan that he isn't the only child to feel fearful about pooping. The program includes choosing foods that make poops softer, visualizing the process of pooping, "potty practice" (sitting on the toilet for a few minutes daily), getting a sticker each time you poop, and rewarding yourself for pooping regularly. The author, a pediatrician, includes a helpful afterword for parents that describes ways to use the program with their children. The softly-colored illustrations are both gentle and expressive (and include two showing the internal digestive system). Children will find empathy and optimism in Ryan's story. Illustrated by Jackie Urbanovic. 32 p., Whitman, 2004. When kids are bullied, they feel sad, frightened, angry, and helpless. Lotty the raccoon is excited to start a new school year, but it's immediately marred by Grant Grizzly, who sits behind her and says mean things, kicks her chair, and steals her things. Her brother and sister suggest some ways to cope, but these don't work. Lotty's parents and teacher become involved, and the story gives a clear message that telling an adult about bullying is not tattling. But teachers can't always be there when children are bullied. When Lotty realizes that Grant is bullying other kids, she forms a Bully Blockers club that responds assertively and collectively to Grant's behavior. This gets teachers' attention, and Grant can no longer get away with bullying. Lots of kids join the club, and they all look out for each other. Grant doesn't frighted Lotty so much any more - he's even helpful at times. The colorful illustrations skilfully depict children's feelings. This empowering story will be just what many children need. Illustrated by Byron Barton. 32 p., Macmillan, 1980. A child who is moving from New York City to "out West" expresses his stereotypes and worries about the West. On the way, he meets a western child who expresses stereotypes and worries about moving East. The child eventually finds out that a lot of the stereotypes are not true, and that the West, although unlike New York in many ways, is quite livable. This story is a good choice for children who have unrealistic worries about their new home and have trouble letting go of them. Illustrated by Jim Fowler. 24 p., Greenwillow, 1993. A girl's parents' best friends, Jean and George, are adopting a baby, and she anticipates all the details of his arrival as she and her parents join with other friends to greet them at the airport. Although things don't go quite the way she'd planned, there's a large crowd of friends at the airport to welcome the family, and their joy and excitement are palpable. As George has promised, the girl is the first to hold the baby, and this is the special moment she'd known it would be. This story offers a sense of identification to children who are welcoming a baby in similar circumstances, as well as a reminder that the connection between people is more important, and more real, than an imagined world where everything goes perfectly. 18 p., Bebop Books, 2003. A six-year-old girl who was adopted from China at the age of five months by a European American couple introduces readers to her house, parents, brothers, grandma, Aunt Laura (the author), cat, and kindergarten class. She and Aunt Laura, who was adopted from Korea, agree that adoption was the best thing that's ever happened to them. No other details are given about feelings about adoption or the adoption process. Adoption is presented in a positive, natural way. Illustrated by Barbara Cooney. 32 p., Doubleday, 1980. Emma, a 72-year-old woman, is often lonely. When she is given a painting of the village where she grew up, she is inspired to paint her own picture, which is truer to her memories. She enjoys this so much that she paints every day. Surrounded by her own paintings of the people and places she loves, she is no longer lonely. This story is a good example of coping with loss by using creative imagination. Illustrated by Adrienne Rudolph. 32 p., Centering Corporation, 2001. A boy wakes up to find his mother crying about the death, that night, of his grandfather. He expresses feelings of loss, abandonment, and anger, and thinks of the things they'll never do together again. His Mommy accepts, and encourages him to talk over, his feelings, and encourages him to keep his memories. As a way to do this, the child makes a memory box, filling it with Grandpa's reading glasses (which remind him of Grandpa's bedtime stories), seeds (which remind him of Grandpa's garden), and other things that remind him of his relationship with Grandpa. Importantly, he shares the box with Mommy. He plants seeds every spring, just as he used to with Grandpa. He expresses the ongoing sadness and joy that the memory box evokes for him. This story shows children a specific way to cope with their feelings of loss, and offers empathy and acceptance.